I may have stirred everyone up today. I told people in my Sunday School department that Jesus wasn’t living in their hearts. That’s not a nice thing to say on Easter Sunday. I had never noticed this before. As we were studying the life of Christ these past few years, I saw for the first time Jesus talking with Peter about His prayers and what He hoped the results would be. As I thought about this I wanted to remind my class that Jesus wasn’t living in their hearts (like our hymns might wrongly teach us) but he was still fully human, fully God and still fulfilling His mission in Heaven. God has sent the Holy Spirit to reside in our hearts. Remembering that Jesus isn’t in my heart but instead is in heaven helps me to realize what He is doing for me there. He has ascended as victor over death and is seated at the right hand of the Father. He is preparing a place for me. He is going to return one day as the King of Kings and Lord of Lords. Now he is interceding for me as He did for Peter, pleading in prayer, that my faith would not fail. Notice that he told Peter not that he was going to pray that all of his problems would go away nor that he would be able to avoid his trials with a happy attitude. 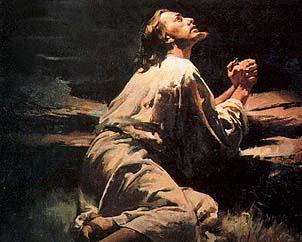 He prayed for Peter’s faith, that it would not fail. Not that Peter would necessarily feel better about himself, but that he would have the maturity and wisdom to lift up his fellow apostles. Jesus was praying for Peter and his faith so that he could use that faith for the sake of others and in so doing launch the church. Instead of sinking into self-destructive despair because of his denial, Peter becomes one of the key leaders in the birth of Christianity. Jesus was already praying for Peter as he prepared Himself for the cross. He is alive, He has risen from the dead. Jesus is now in Heaven and He is praying for me – He is praying for you.